Kakapo are extremely rare parrots found in New Zealand. There are only 125 left in the world. They were wiped out by introduced predators such as cats, dogs, stoats. They are flightless, nocturnal parrots that live on predator free islands protected by the government. The only people on the island are a few rangers who help take care of the conservation project. One of the bird’s named Sirocco was hand raised due to an illness when he was young. Because of this he is very attached to people. When he became sexually mature he began ambushing people to try to mate with their heads. Although it is amusing to watch, he is relentless and one time he was injured by someone not interested in his advances. I volunteered my expertise as an animal trainer to help solve the problem. The team and I trained Sirocco to do an acceptable behavior, like stationing on a stump, and in return we offer him an object with which he can make. He seems to prefer crocs shoes. This has helped keep him well behaved and also results in desired consequences for the bird. Sirocco is also an ambassador bird for the project and makes public appearances. Some of his training involved preparing him for this role. Very few people in this world get the chance to see such a rare bird and allowing the public to get to know Sirocco has really helped raise awareness and funding for the project. Our future goals are to train future offspring to voluntarily participate in their healthcare. We also hope to raise a few birds that are not important to the breeding project to be ambassador birds like Sirocco. These birds will also require training so that the experience is pleasant for both the birds and the public. I also work with a project called The Bird Endowment. The Bird Endowment focuses on saving blue throated macaws in Bolivia. They keep a flock of genetically diverse birds in Texas in case the macaws go extinct in the wild. They want the birds to behave like wild birds in case they ever need to be released in Bolivia. Several years ago a chick hatched at the Bird Endowment that was rejected by her parents. I was asked to raise the bird and train her to be an ambassador bird for the project. Her name is Blu Lu and she lives with me. I trained her to paint pictures of other parrots. The paintings are auctioned off to raise funds for The Bird Endowment. Blu Lu is named after Blu Lu Barker, a famous blues singer. All the birds at The Bird Endowment are named in honor of blues artists. Why do you have a passion for this in particular, is there a personal tie? I have had a companion parrot for over 26 years. This bird has taught me a great appreciation for parrots. So much so that when I started out as a professional animal trainer I specialized in birds. I do work with everything now but birds still hold a special place in my heart. Kakapo are fascinating parrots because they are so unusual. I first learned about them from the David Attenborough program called Life of Birds. I never thought in 1 million years I'd get the opportunity to work with them. But every time work brought me to Australia. I tried to include a stop in New Zealand and connect with the Kakapo Recovery Team. They finally agreed to meet with me and since then we have accomplished some great work together. I worked with my first blue throated macaw for an instructional DVD on parrot training. I found this bird to be such a joy to train. When The Bird Endowment contacted me about Blu Lu, I knew I couldn't say no. Once you connect with an animal personally, it becomes very easy to become an advocate for their conservation in the wild. Like many conservation projects, funding is always of concern. The Kakapo Recovery Program can accept donations directly from their website. People have done some creative things to raise money for kakapo. Some people sell art, some people except donations instead of birthday gifts, and some schools have done fund-raising campaign as a student project. The Bird Endowment has a unique program in which people can adopt a nest in the wild. For $250 your initials will be placed on a nest box in Bolivia. You will receive a certificate and notification if any macaws use your nest box and hatch chicks. A lack of nesting sites has been a big problem for blue throated macaws in the wild. If people can't afford to send money, it always helpful to raise awareness by spreading the word about these projects using social media. Just posting a link to their websites and saying that you like them is helpful. There are many causes to support out there. But I truly believe in finding something you are passionate about and then looking for ways that your expertise can be of help. Then your contribution is far more meaningful. It becomes more than social responsibility or obligation. It feels like you are doing exactly what you're supposed to do. It becomes a natural extension of who you are. I have two half sleeves that are all birds. One of the birds is a baby kakapo. This was the first kakapo I ever met in person. 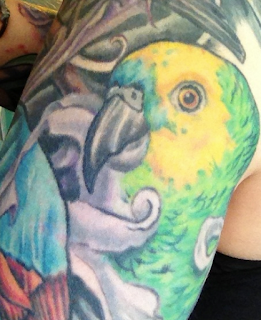 I also have a tattoo of my Amazon parrot that I've had for 26 years that inspired my devotion to parrot conservation.